In the realm of things I can't really get enough of there is Muranda Cheese. The British Cheddar and Colby specifically. Oh, the other flavors are stellar too--Red Buddy and the Garlic Cheddar--but I am bereft if I open the cheese drawer in the fridge and find that I'm out of the cheddar. It is an impressive cheese for its age--they're just coming up on a year. Waiting to see how these incredible cheeses will age over time feels like anticipating Christmas. You can read more about Muranda Cheese Company in the latest issue of Edible Finger Lakes (my story on local cheeses is part of what I meant when I said that eating local is also eating decandantly in Central NY.) But don't just take my word for it, check it out yourself--Muranda Cheese can be found in the "F" tent of the CNY Regional Market from 7am-2pm on Saturdays. The most recent issue of Edible Finger Lakes can be found around Syracuse including the Regional Market beginning this Saturday. I think its the best issue yet. Edible Finger Lakes--Good Enough to Eat? I love the Edible magazines--they seem to be multiplying like tribbles and I wish I could subscribe to them all. But check out our own Zoe Becker, editor of Edible Finger Lakes speaking about what makes the Finger Lakes edible. You gotta wait for it though--she's the last one in the clip. 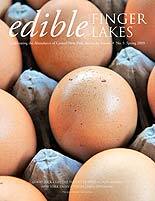 The winter issue of Edible Finger Lakes is out now--look for the cover with beautiful beets. Keep up the great work Zoe! Clip courtesy of Bruce Cole and the Edible Nation blog. This is going to totally ruin my Brooklyn cred but I don't care. Hanging out with Lucy Loo (on the right) a five month old buffalo and her pal Bucky, a Jersey steer (to the left) ranks among the coolest things I've done--EVER. She's still a baby but look at the size of her head compared to, say, my head. She's going to be huge--like up to 1,500 pounds huge. You can read all about Lucy Loo and the incredible herd being raised at PDH Buffalo Farm in my piece in the Winter 2008/2009 issue of Edible Finger Lakes out now. You can pick it up free around Central New York or subscribe here.